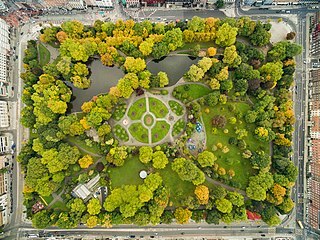 An urban park or metropolitan park, also known as a municipal park or a public park, public open space, or municipal gardens (UK), is a park in cities and other incorporated places to offer recreation and green space to residents of, and visitors to, the municipality. The design, operation and maintenance is usually done by government agencies, typically on the local level, but may occasionally be contracted out to a park conservancy, friends of group, or private sector company. The Walled City of Lahore, also known as Old City, forms the historic core of Lahore, Pakistan. The city was established around 1000 CE in the western half of the Walled City, which was fortified by a mud wall during the medieval era. Renovation and Expansion Along with renovation of the Minar-i-Pakistan (Pakistan Resolution Movement), the project features expansion of the Iqbal Park by including it in the stretch of Circular Road between the park and Lahore Fort. The 125 acre green oasis is surrounded almost entirely by the old city of Lahore. The project was started on October 10, 2015 and was completed on November 9, 2016 incurring a total cost of PKR 981 million as quoted by the contractor of the project. The construction project was awarded to Habib Construction Services which is one of the largest construction companies of Pakistan and have worked on several other mega projects previously. Also history museum and an outdoor amphitheater are under construction inside the park premises. Minar-e-Pakistan is a national monument located in Lahore, Pakistan. The tower was built between 1960 and 1968 on the site where the All-India Muslim League passed the Lahore Resolution on 23 March 1940 - the first official call for a separate and independent homeland for the Muslims of British India, as espoused by the two-nation theory. The resolution eventually helped lead to the emergence of an independent Pakistani state in 1947. The Lahore Fort, is a citadel in the city of Lahore, Punjab, Pakistan. The fortress is located at the northern end of walled city Lahore, and spreads over an area greater than 20 hectares. It contains 21 notable monuments, some of which date to the era of Emperor Akbar. The Lahore Fort is notable for having been almost entirely rebuilt in the 17th century, when the Mughal Empire was at the height of its splendour and opulence. The Tomb of Allama Muhammad Iqbal, or Mazaar-e-Iqbal is a mausoleum located within the Hazuri Bagh, in the Pakistani city of Lahore, capital of Punjab province. Mian Muhammad Shehbaz Sharif is a Pakistani politician who is the current Leader of the Opposition in the National Assembly of Pakistan, in office since 20 August 2018. He has been a member of the National Assembly since 13 August 2018 and is the current President of the Pakistan Muslim League-N. He has recently served his third term as the Chief Minister of Punjab from June 2013 to May 2018. Tourism in Pakistan is a growing industry. In 2010, Lonely Planet termed Pakistan as being "...tourism's ‘next big thing’ for more years than we care to remember. [But] world media headlines [always] send things off the rails". In 2018, the British Backpacker Society ranked Pakistan as the world's top adventure travel destination, describing the country as "one of the friendliest countries on earth, with mountain scenery that is beyond anyone’s wildest imagination." The country is geographically and ethnically diverse, and has a number of historical and cultural heritage sites. According to the Travel and Tourism Competitiveness Report 2017 released by the World Economic Forum, the direct contribution of travel and tourism to Pakistan's GDP in 2015 was US$328.3 million, constituting 2.8% of the total GDP. According to the World Travel and Tourism Council, the direct contribution of travel and tourism to Pakistan's GDP in 2016 was US$7.6 billion, constituting 2.7% of the total GDP. By 2025, the government predicts tourism will contribute ₨1 trillion (US$9.5 billion) to the Pakistani economy. Begum Kulsoom Nawaz Sharif was a Pakistani politician who had been the first lady of Pakistan for three non-consecutive terms; from 1990 to 1993, 1997 to 1999 and then from 2013 to 2017. She was the President of Pakistan Muslim League (Nawaz) from 1999 to 2002. The Bab-e-Pakistan is a national monument in Lahore, Punjab, Pakistan which is being built on the site of one of the major Muslim refugee camps which operated in the aftermath of independence of Pakistan. The memorial was proposed in 1985, by the late Governor Ghulam Jilani Khan, and was approved immediately by the President Muhammad Zia-ul-Haq. The monument is designed by a Lahore-based architect Amjad Mukhtar, who is a graduate from National College of Arts, Lahore. The monument has an area of 117 acres and will comprise a memorial block, library, park, museum, auditorium and art gallery. Khawaja Saad Rafique is a Pakistani politician who has been a member of the National Assembly of Pakistan since October 2018. NA-125 (Lahore-III) is a constituency for the National Assembly of Pakistan. The Nawaz Sharif Medical College (NSMC) is a medical school located in Gujrat, Punjab, Pakistan. It is a constituent college of the University of Gujrat. It offers MBBS degree in affiliation with University of Health Sciences, Lahore. NSMC is accredited by the Pakistan Medical and Dental Council (PMDC). It is also recognized by the College of Physicians and Surgeons Pakistan (CPSP) for postgraduate training programs. The college is listed in International Medical Education Directory (IMED). The Javed Manzil or the Allama Iqbal Museum is a national monument and museum in Lahore, Pakistan. Muhammad Iqbal lived there for three years, and died there. It was listed as a Tentative UNESCO site, and was protected under the Punjab Antiquities Act of 1975, and declared a Pakistani national monument in 1977. In honour of Iqbal, a Pakistani national poet, it was converted into a museum, inaugurated in December 1984. Punjab is the second largest province in Pakistan. It is known for its ancient cultural heritage as well as its religious diversity. The lands of Punjab have been home to a number of religions and civilisations. The Indus Valley Civilization once ruled the region and a significant archaeological find was discovered at the ancient city of Harrapa. The Gandhara civilisation was also quite dominant in the northern region of Punjab at the site of Taxila. Several other civilisations such as Greeks, Central Asians, and Persians ruled Punjab leaving a number of sites which still exist today. The arrival of Islam came about during the rule of the Umayyad Caliphate followed by the Ghaznavids. The Mughals took control of the region and ruled its land for several centuries. The mughal heritage remained quite strong in Punjab with a large number of forts, tombs and monuments still intact today. The Durrani Empire ruled the Punjab at the fall of the Mughal Empire for a short period following the rise of the Sikh Empire. The strong control of the Sikhs also lead to a number of sites still remaining intact throughout Punjab. The British Raj took control of the region until the independence. The Panama Papers case, or the Panamagate case, was a landmark decision by the Supreme Court of Pakistan that disqualified incumbent Prime Minister of Pakistan Nawaz Sharif from holding public office for life. ↑ Zafar Iqbal. "Bury the hatchet". gulftoday.ae. Retrieved 2012-03-23. ↑ "Greater Iqbal Park to open for public on August 14". Express Tribune. 13 July 2015. Retrieved 15 July 2016. ↑ "Prime Minister Nawaz Sharif formally inaugurates Greater Iqbal Park in Lahore". DAWN.COM. 2016-12-17. Retrieved 2016-12-17. Wikimedia Commons has media related to Iqbal Park (Lahore) .